So this is Brook, so funny character "i can't se anything aaaaah, oh i don't have eyes, i forget that"
for title i inspire myself from Hawksley's song and from Burton's movie "beetlejuice" just because the stripes. Hey nice work, I don't like One Piece but this wall is great! Good job.. Thanks for share.. 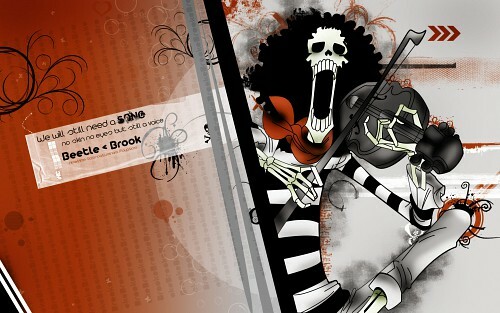 I love One Piece very much! Wow! that one's awsome! jajaja... "That music sounds good... ah! but i have no ears to hear! Yohohohoho!"... XD yeah, so sorry, this one was very bad, jejeje.